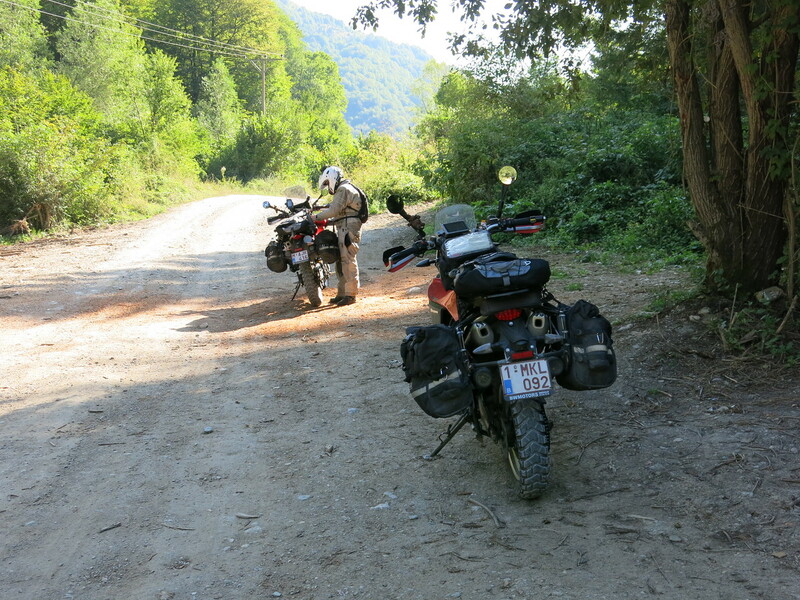 After another oatmeal breakfast, with proper milk this time, we’re ready to hit some Bosnian gravel. 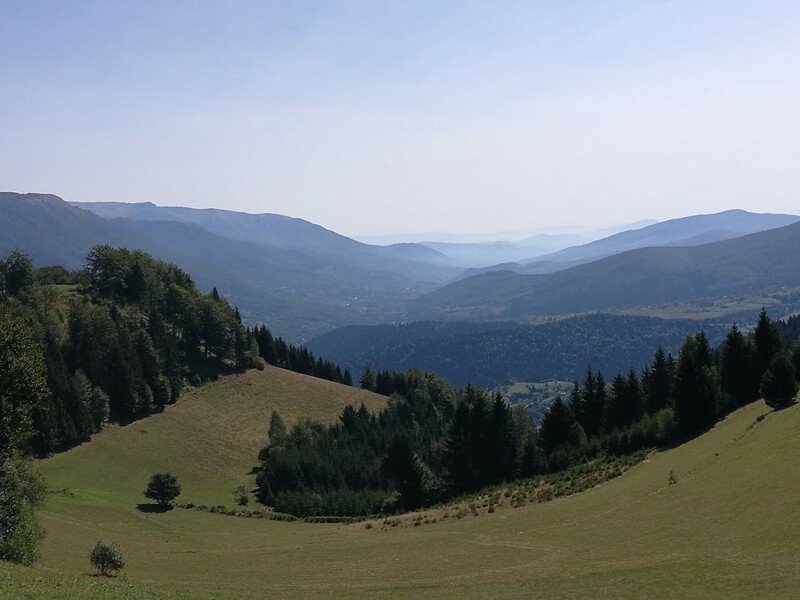 From Jajce it should be an easy 2 days riding to the camp site in the mountains around Kolasin where HU Montenegro takes place. Using our time today to do some exploring would still bring us into Tara canyon tonight. There’s a wide choice of camp sites around that area, both on the Bosnian and Montenegrin side. When we ride onto the first stretch of gravel, it’s time to lower the pressure on our tyres a little. We plan to do a lot of mountain tracks and trails the coming weeks. A bit more flex in the tyres will make it more pleasant and comfortable. The roads we’ve picked turn out amazing. It’s an continuous string of good quality meandering gravel roads, only interrupted for the occasional stop to take in the views from the mountains. We thoroughly enjoy these back roads between Jajce and Travnik. Much more interesting than the main roads with the speed traps and busy traffic. After a brief stop at a Konzum supermarket and a bakery in the Travnik city center, we’re glad to get back back onto similar trails. And we’re rewarded for it. During our lunch stop next to one of the many war memorials every single car that passes honks or has its occupants waving enthusiastically. If we weren’t back in the adventure travelling spirit yet, this sure does it. Building on the positive vibe we decide to take our chances on another trail through the maintains. Our maps suggest there should be a way across, but neither the Garmin nor the Openstreetmap GPS are conclusive. It starts off very promising until we reach a small village and none of our navigational aids have any of the roads and junctions anywhere near accurate. We go by compass and pick a road which leads up in the mountains. After passing the last house the road quickly deteriorates into a narrow track. It gets quite rough and too narrow to turn around easily so we persevere. It’s getting clear that this will not take us to where we want to go, and through the intercoms I’m well reminded by Sofie’s swearing and cursing that she doesn’t really enjoy these kinds of trails. 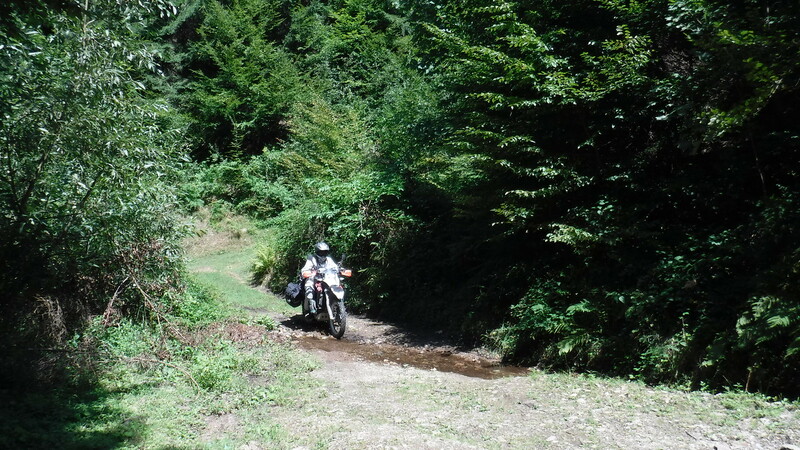 The wheel tracks turn into ruts and a bit further we have to cross a small stream. Sofie is by now quite vocal that this wasn’t exactly what she signed up for. Then, the track simply dead-ends in a small grass field with a little waterfall running down some rocky steps. On a trials bike it might be possible to push on a bit further, but for us the little field is a welcome opportunity to turn the bikes around and return to the village. None of our maps are of any help, so we ride to where we last saw other people, near a small house right under the minaret of the village mosque. We are received with smiles by the 2 men standing outside, quickly followed by them calling to a girl inside the house. Zafira comes and joins us to translate. She speaks reasonably good English and explains we’re talking to her father and uncle. 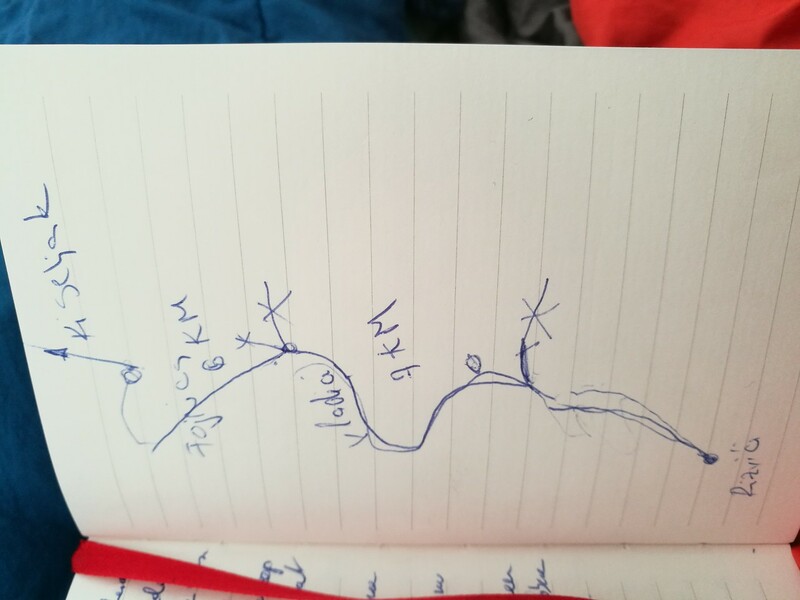 After a bit of discussion and lots of pointing at places on the map her father draws the route in my diary. Meanwhile we’re being fed fresh raspberries and are offered tea and coffee, which we politely decline. At one point Zafira’s uncle notices the country codes listed on the screen of my bike. They don’t seem to believe we rode our bikes all the way to Iran. So Sofie shows them the a picture of her in a hijab at the Iranian border. Hilarity ensues. As do the jokes about my beard and Hezbollah. It is a really pleasant encounter and by the time we put our helmets back on we have already taken almost an hour of these friendly people’s day. It still surprises me how friendly we are treated whenever we stop somewhere in Bosnia, regardless of the region. 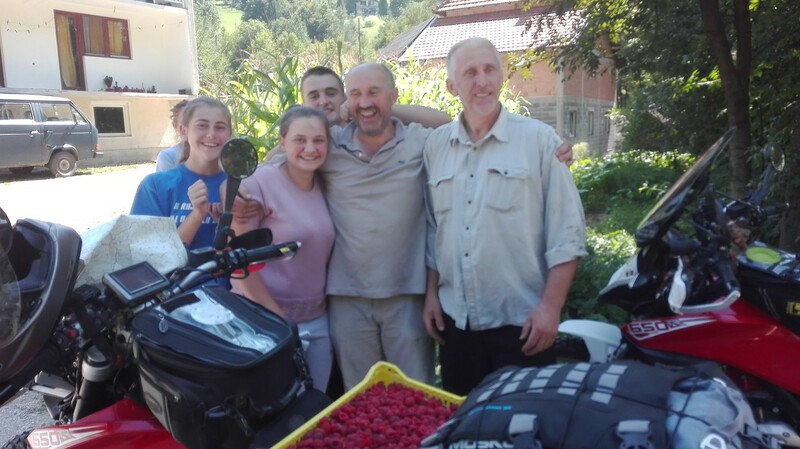 Whether it is in Bosnia, Herzegovina or Srpska, people welcome us with open arms, help with whatever they can and want to treat us to coffee, tea or snacks. It is really a shame they haven’t yet found a way to treat each other the same way they treat “neutral” foreigners. 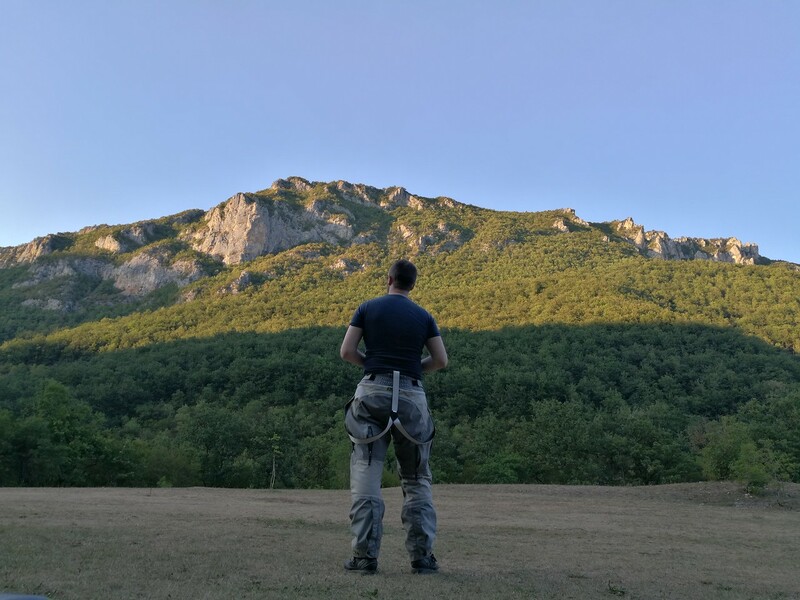 Bosnia is such a beautifully diverse country where East could actually meet West, if only the pain and lingering hatred from the civil war could be overcome. At the moment the society is very segregated and everybody just keeps to their own. The different cultures seem to have completely stopped their interactions with each other, despite all of them enthusiastically engaging with outsiders like us. The instructions from Zafira’s family are highly accurate and soon enough we’re back on asphalt roads making a wide arch around Sarajevo. On the way we pass the Olympic sky jump we already visited in 2014. From there larger, but winding and quiet roads swiftly take us to Foca and onwards to the border with Montenegro. 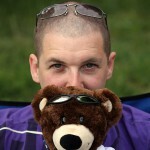 We know of a nice camp site on the banks of the Tara, not too far from the border crossing. It is a bit tricky getting there, as the road we need starts in the middle of no-man’s land between the 2 border posts. We pass the turnoff first to go through Montenegrin customs and immigration and then get permission to turn back towards the road to the Tara Grab camp site.